My friend and I stopped in Princeton, New Jersey, for ice cream on the way back to Philly. We’d been to the newly opened Duke Farms, the historic estate of the Duke family (Doris Duke, Duke University, J.B. Duke) in Hillsborough, New Jersey. It is now a nature preserve for hiking and biking with messages of environmental stewardship amidst vestiges of decayed opulence (mansion ruins, crumbling fountains, occasional sculptures). We walked about seven miles on a hot day and were underwhelmed with the lack of color and variety. The Duke mansion is not even included in the public area. 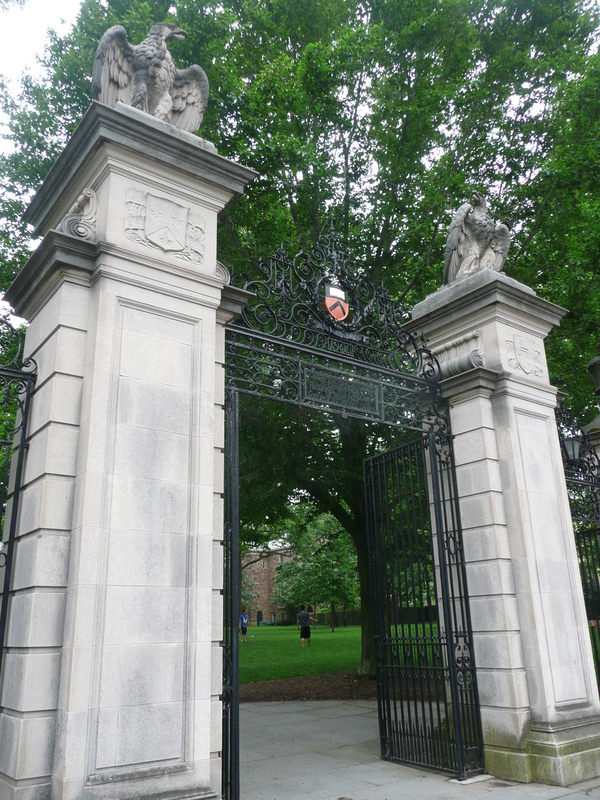 I had not been to Princeton in many years. After eating a great chocolate peanut butter ice cream cone, I took a quick walk to Nassau Hall, the “old main” of Princeton University, one of only nine colleges chartered in the colonies before the American Revolution. It is the oldest building on campus and was the largest building in New Jersey and one of the largest in the colonies when it was built in 1754. 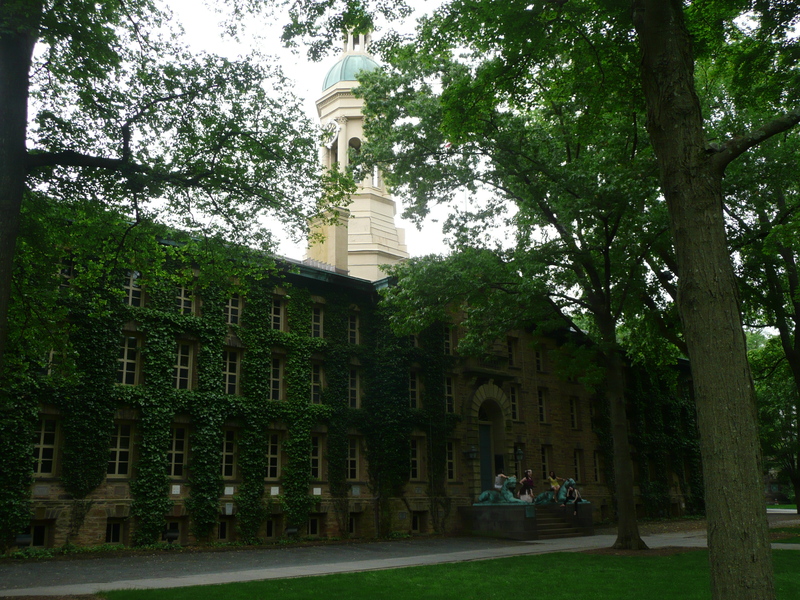 Appropriately, it is covered with ivy (well half of it), and over the years has served many functions for the College of New Jersey (later Princeton in 1896). The building was named to honor the memory of King William III of the house of Nassau. During the course of the Revolutionary War, the Hall served as both barracks and hospital and both British and American forces occupied it for periods. It suffered battle damage when the Americans fired on it to flush out British soldiers who had sought refuge inside during the Battle of Princeton January 3, 1777. A popular story from the event says that a stray cannon ball fired by the American troops decapitated a portrait of King George II and the frame was later used for a portrait of George Washington. Not sure if there is historical evidence to document the story. 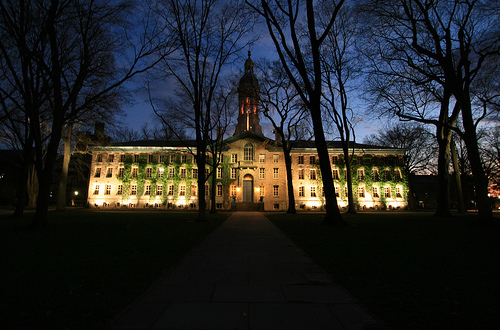 For four months in 1783, Nassau Hall was capital of the country. The United States Congress met there before moving to Annapolis, Maryland. It was in Nassau Hall that Congress heard the official word that the peace treaty confirming independence had been signed with Great Britain. In praise of Old Nassau. Three cheers for Old Nassau. Presidents Madison and Wilson walked its halls. The first ever commemorative stamp issued on color paper by the U.S. Postal Service featured Nassau Hall. In 1960 the venerable building was finally declared an official national landmark. This entry was posted in 18th century, 19th century, American Revolution, city/town and tagged Nassau Hall, NJ, Princeton University. Bookmark the permalink. was hoping you’d catch that!